Norway has led the surge by committing to end the sale of gas and diesel vehicles by 2025, followed by India in 2030 and Britain and France in 2040. California’s zero-emissions vehicle programme is by itself a policy that would grant support for greater demand of EVs in the US. China’s government issued a New Energy Vehicle (NEV) credit mandate that takes effect this year, setting out a minimum requirement for the car industry for production of new energy vehicles with some flexibility offered through a credit trading mechanism. 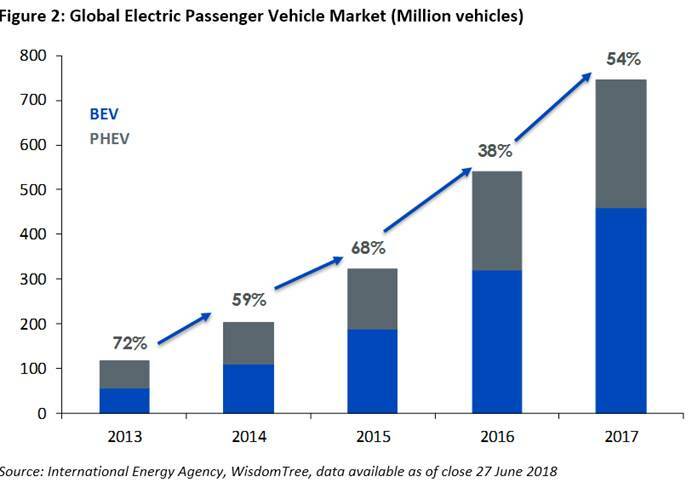 In 2017 sales of global passenger EVs surpassed the 1-million-unit mark, posting a 54% increase over the year before, higher than the previous annual growth rate of 38% in 2016. China accounted for nearly 50% of global sales of EVs, representing a market share of 2.2% in 2017. The International Energy Agency (IEA) has doubled its central forecast for EVs, raising its 2030 EV fleet size estimate to 58mn from 23mn. Closely mirroring the growth of charging infrastructure, sales of pure Battery Electric Vehicles (BEVs) were up 63% leading the pack, ahead of Plug-in Hybrid Electric Vehicles (PHEVs) that rose 40% in 2017. BEVs are powered solely by an electric motor, using electricity stored in an on-board battery, that needs to be charged regularly. In contrast, PHEVs are powered by a combination of an electric motor and an ICE that are designed to work in unison or separately. The on-board battery can be charged from the grid, while the ICE supports the electric motor when higher operating power is required, or the battery’s power is low. BEVs are known to have the highest efficiency and have the great environmental benefits when powered by electricity from renewable sources. Finally, Wisdom Tree economists points to increased demand for new metals such as nickel, lithium, cobalt, copper and aluminium that is paving the way for the rising pace of EV adoption. Lithium-ion batteries comprise a family of battery chemistries that employ various combinations of anode and cathode materials. The lithium-ion technologies can be compared along six dimensions: cost, safety, specific power, specific energy, performance and life-span. Currently the lithium Nickel-Manganese-Cobalt (NMC) is the most prominent technology for automotive applications. Rapid technology advances in battery chemistry is shifting to a higher proportion of nickel. 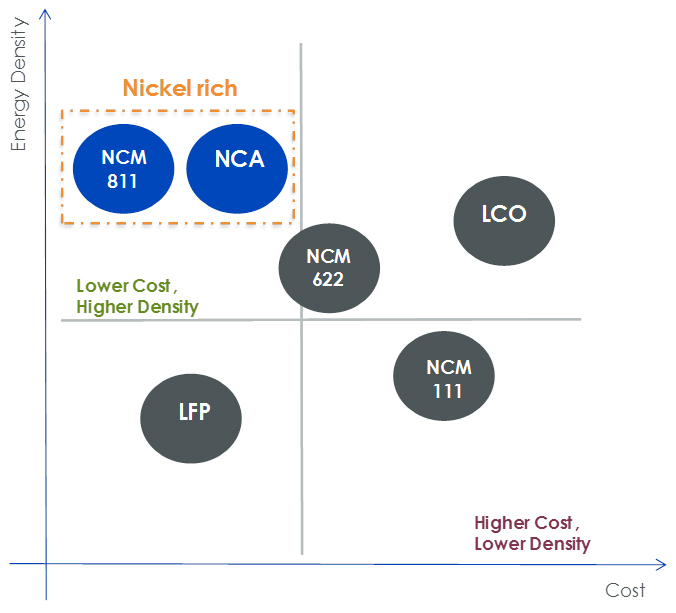 While the NMC battery typically contained equal portions (1-1-1) of nickel, manganese and cobalt, the optimal ratio is now considered to be (8-1-1), thereby demanding higher percentage of nickel. 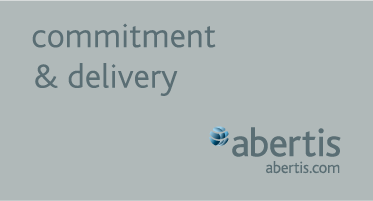 This combination has provided the added advantage of lower costs and higher energy densities, although it comes at the cost of lower voltage. While demand for nickel, cobalt and lithium is projected to rise, more traditional commodities such as copper and aluminium are poised to benefit from burgeoning EV industry. Aluminium, known for its light weight, helps reduce the weight of the vehicle considerably in comparison to steel. The decrease in the car’s total weight will reduce its energy consumption by nearly 8%, thereby improving its energy efficiency. An average electric car requires 80 to 90 kilograms of copper compared to the 25 kilograms for a conventional passenger car. Copper demand has been forecasted to witness a nine-fold increase from EVs. 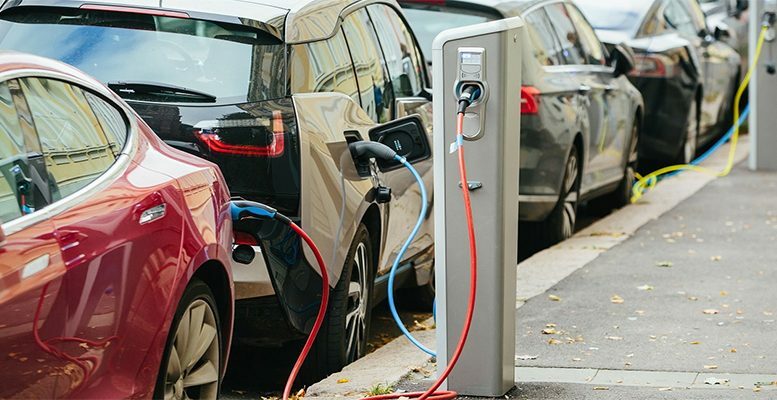 The potential rise in demand stems from the elevated levels of copper windings in EVs compared to the ICE and growing infrastructure requirements.